Pickled beets jumped out at me this weekend while at the farmers market. I brought home a beautiful bunch of beets with the greens, for just $2.50 this was a real steal. I made a list of what I could do with them: Roasted beet salad with blood orange vinaigrette, Beet chutney, beets in butter with a splash of rice vinegar and in the end, pickled beets won. I suppose I thought the bunch of beets was larger than it really was. The first step in all the recipes is to cook them. There are several ways, the best method and least messy is to steam them. Here’s the thing about beets. They will “bleed” this lovely magenta color everywhere and leave a legacy of stains behind them. Trick of the trade: Don’t cut, nick or peel them before cooking. Trim leaving 1-2″ of stem; soak to remove soil and sand. Do not peel or cut. Trim the roots from the stems by cutting at least 1-2 inches of stem remaining on the root end. Leave the tap-root end in tact also, don’t trim it, just tuck it out-of-the-way. 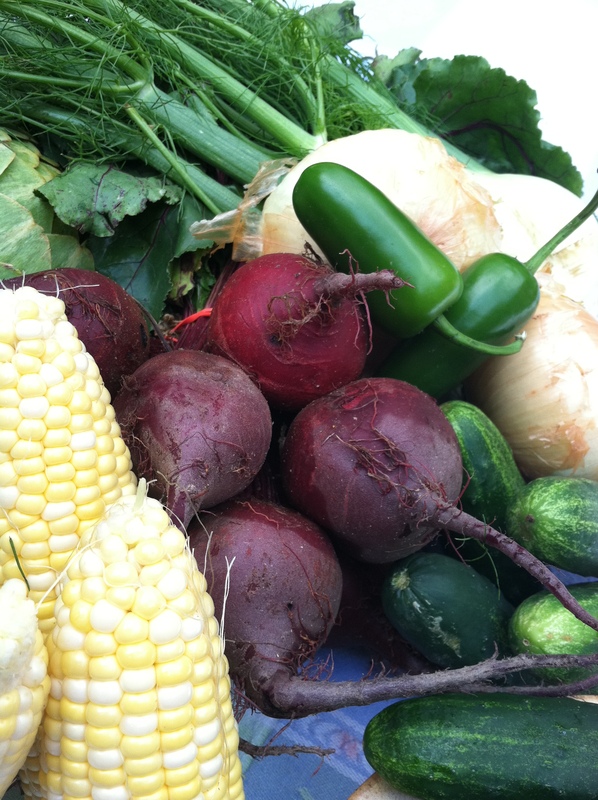 Gently wash the beets to remove excess soil and sand. Don’t scrub them as they have a thin skin. Soaking for a few minutes is usually good. Keep the greens. Set them aside in a large deep bowl of cold water. Remove any yellowish or ‘spotted’ leaves you wouldn’t want to eat. Soak the leaves in cold water. Swish the leaves in the water gently. The sand will fall to the bottom of the bowl. Lift the leaves from the bowl without disturbing the bottom and repeat at least 4 times. You will be amazed how much sand and soil the leaves can hold. Soak greens to remove dirt, and sand. Lastly, rinse the leaves under running water, wrap in a towel, cover with plastic wrap or bag and store in the refrigerator until you want to use them in the next couple of days. That is another post. 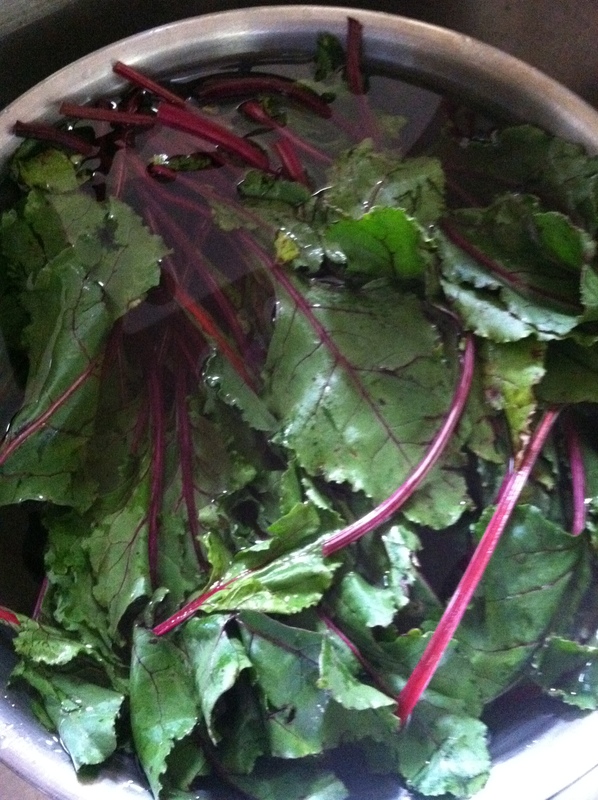 How to use the beet greens is another post coming soon. The greens need to be cared for as soon as you remove the root ends so you don’t lose quality. If the greens look limp at first, they crisp up during the soaking process. 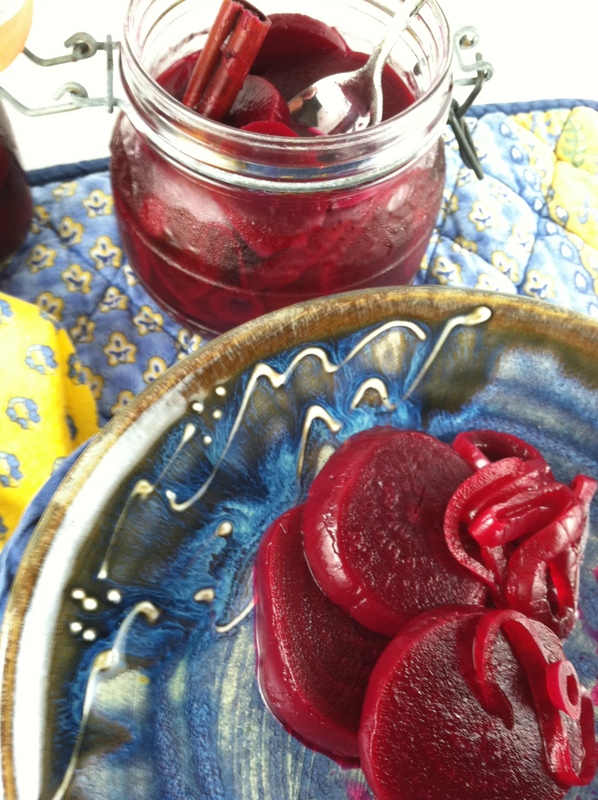 This recipe for pickled beets is simple and very flavorful. Some folks say they can eat the entire batch at once but that’s not recommended. Steaming the beets takes the longest amount of time. 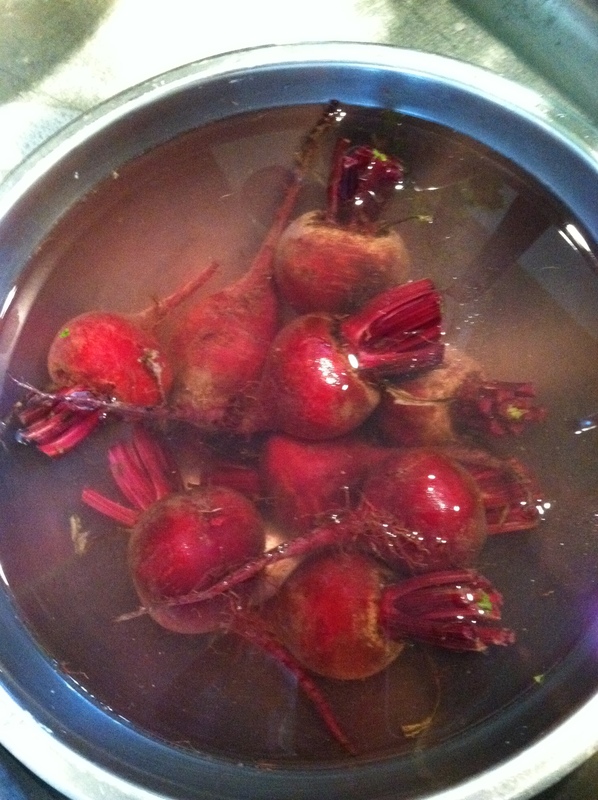 Steam the beets by placing them in a steamer pot with a tight-fitting lid. 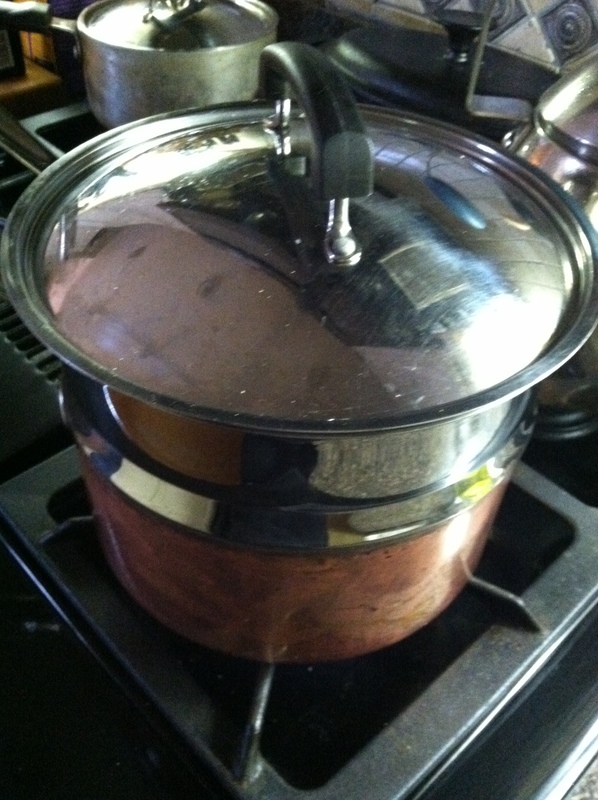 Use good quality water to steam the beets. You will use 1/2 cup of this water in the pickling brine. Steam the beets until easily pierced with a paring knife, just as you test a baked potato for doneness. Do not pierce the beets often or all over as they will “bleed”. You want them to retain the color. Just test the biggest ones. When the beets are done, save the water in the bottom pot and place the beets in a big bowl of cold water. Once they are cool, underwater, using your hands, slip the skins off.The skins slip off very easily. Set the peeled beets aside in another bowl. Peeling underwater helps keep your hands from staining magenta. Using a cutting board you can bleach later, trim the top and bottom, then slice the beets into thick slices and place them back into the bowl. 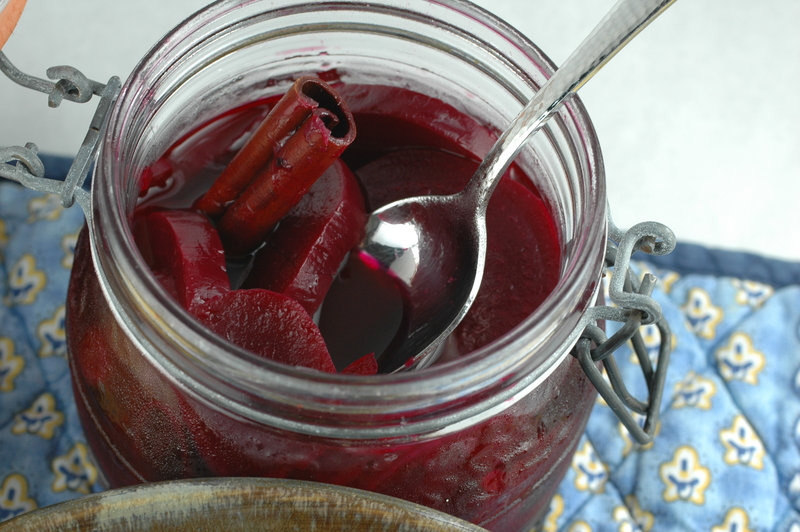 Make the brine and have the jars or containers you are going to store the finished beets in ready to fill. Bring the beet water and vinegar to a boil, add the remaining ingredients, including the onion and return to a boil. Boil for 1 minute. Pour the hot mixture over the beets and gently stir with a rubber spatula to ensure all the beets are coated. Pour the hot brine over beets, place in storage jars, cool. Serve cold. Gently place the beets and all the brine into the storage jar. Allow to cool then refrigerate. The pickled beets are ready to eat after 24 hours. One of my favorite parts are the onions that get pickled too. Slightly crunchy and what a taste treat! Pickled Beets – I could eat the whole jar! 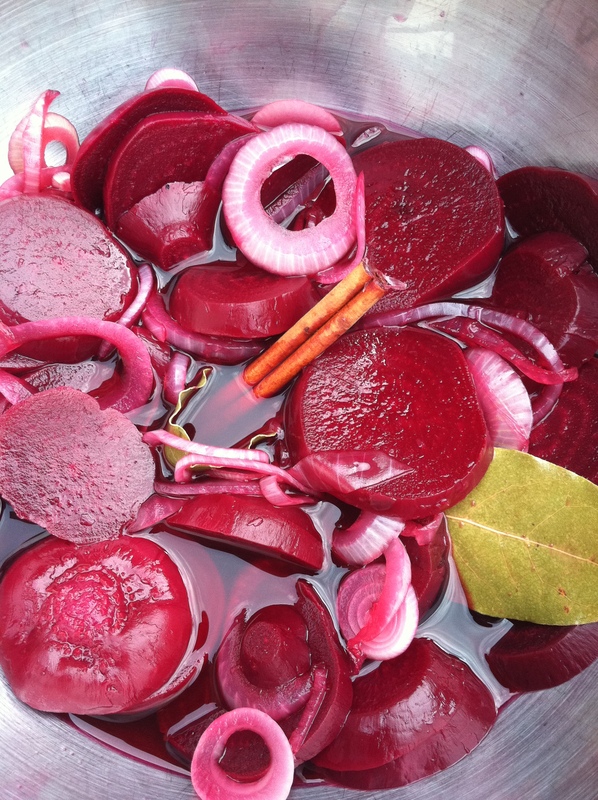 This entry was posted in Recipes, Southern Cooking, What every good cook should know and tagged Beet, Brine, cook, Home, how to pickle beets, Onion, Pickled Beets, Pickling, recipe for beets. Bookmark the permalink. I love fresh beetroot – so much nicer than bottled. Never added a cinnamon stick before – sounds great. You can’t really taste the cinnamon, it just deepens the flavor. More beautiful photos. I must try this. oh wow… did I miss this? wonderful idea, and beautiful photos too. how long do they last in the fridge? gotta try this soon! They should last a while, being pickled. The two jars I made for the post are almost gone and it hasn’t been a week yet. I just eat them, Robert loves them on salads and with grilled meats and fish. Robert is my sweetie, the love of my life. My son doesn’t like pickles (or tomatoes or onions) ;(, but I love him anyway. 😉 My son is graduating from college next year. It’s great to see the adult he has become. As much as I loved watching him grow up, it is very rewarding to see him as a responsible young man. She is adorable and with a mom like you, she is sure to be a marvelous young lady. It goes by much too quickly. I miss my boy being that young. It is a special time of their lives, the innocence, boldness and curiosity is fascinating and trying at times too.